One of trainer Mike Moroney's main spring carnival hopefuls, Savile Row, has arrived in Melbourne. The rising four-year-old finished second in three Group One races in New Zealand this season before being spelled after finishing unplaced in the New Zealand Derby won by Gingernuts. will be given his chance to do likewise this spring. "He should be well in the weights at the handicaps." The Group Two Bobbie Lewis Quality (1200m) is at Flemington on September 16.
he raced to his first Australian win at Caulfield last Saturday week. 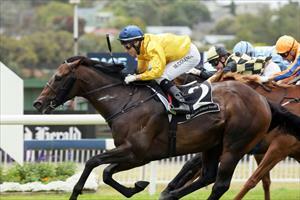 sixth over 1400m in his first two starts of the campaign at Flemington. three weeks in the paddock before getting ready for a spring preparation. starts including a 1600m Listed race in Toulouse last September. over 1400 metres here," Moroney said. mile-and-a-quarter horse, which is good." - Racing News.